Shon F. Barnes joined the Salisbury Police Department at the rank of Deputy Chief on May 15, 2017. He was previously a Captain with the Greensboro Police Department where he began his career as a patrol officer in November 2000. He has vast experience in police leadership serving as the commander of the Central Patrol Division, Southern Patrol Division, Operational Support Division, and the Training Division. Shon Barnes attended Elizabeth City State University where he received a B.A. Degree in History/Pre-Law, and the University of Cincinnati where he received a Master’s Degree in Criminal Justice. He has earned a PhD in Leadership Studies from North Carolina Agricultural and Technical State University where his dissertation focus was racial disparities in traffic stops and the role of police leadership in community engagement efforts. 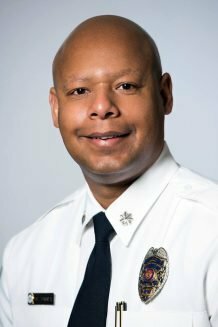 He has completed the Senior Management Institute for Police and is an alumnus of the Southern Police Institute at the University of Louisville where he was recently selected to serve as the President of the alumni association. Barnes was selected as the 2015 National Institute of Justice LEADS Scholar for conducting research using a meta-analysis predictive-policing algorithm based on five years of reported crime data.